Wunderlich is a German aftermarket tuning company that works so closely with BMW, it’s kind of even tipped BMW’s hand at time with what’s to come. 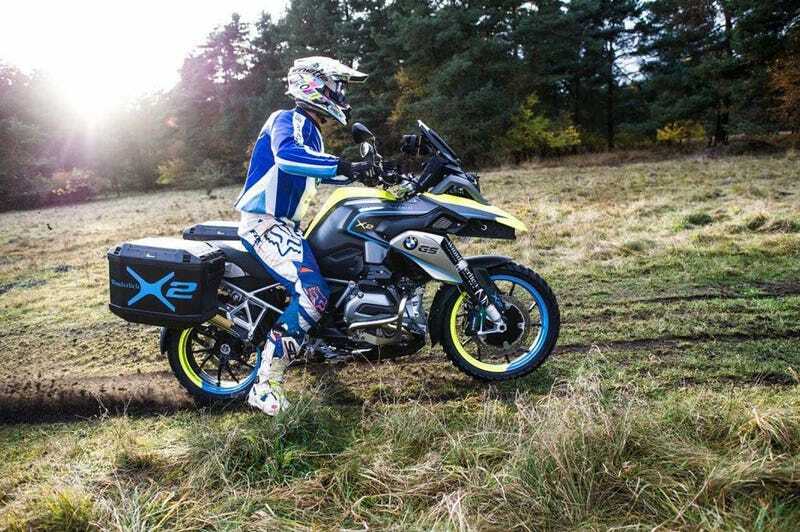 Their latest concept is a particularly interesting one, as it gives the massive adventure bike BMW R 1200 GS a second, electric motor and affixes it to the front wheel. It calls this concept the BMW R 1200 GS LC, and it adds a 13.6 horsepower electric motor to the front in addition to the massive 1,200 cc, 125 horsepower water boxer engine that powers the back. Wunderlich claims that little front motor is good for up to 12.5 mph, even when the gasoline engine is shut off, and that it will also work in reverse for up to 2 mph. The battery for the little motor charges with energy created from braking. A second motor at the front, even with such little power, would actually make a noticeable impact on the way even a huge bike like the 1200 GS handles. It would help pull the bike through turns more, much like it does on an all-wheel drive car, and would add drive and increase traction in the dirt - not to mention putting that reverse to use in Starbucks parking lots. Wunderlich, a brand that’s sort of like Dinan is to BMW to AMG is to Mercedes, isn’t the first to take a crack at two-wheel drive applications for off-road use. A tiny little brand called Christini has been making two-wheel drive dual sports which have actually been used by the military. Wunderlich says this is still just a concept for now, but with Christini proving the benefits of two wheel drive and a platform like the GS that loves to be farkled, there’s no reason to think we won’t see this make it into production soon. Contact the author at sean.macdonald@jalopnik.com. Follow Lanesplitter on Facebookand Twitter.